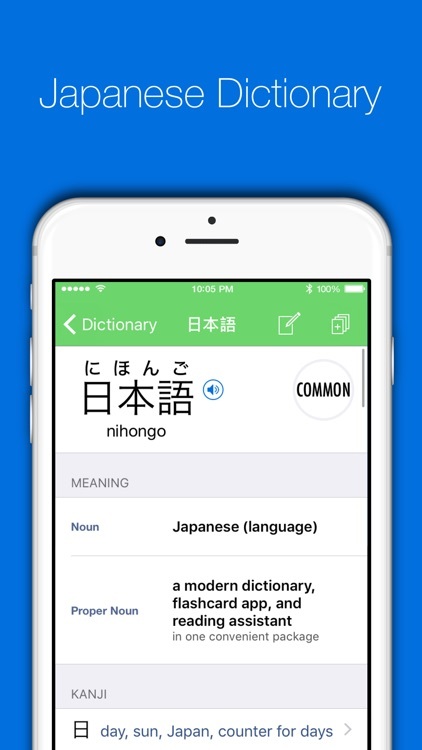 Nihongo is a Japanese dictionary, flashcard app, and reading assistant, designed to make the best use of the time you dedicate to studying Japanese. 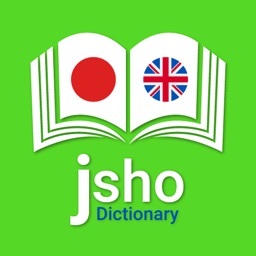 Our dictionary is made to find what you're looking for fast, with the words Japanese speakers actually use at the top of every search result, and every word marked as "common", "uncommon", or "rare". "Clippings", our reading assistant, is what makes Nihongo stand apart from other dictionaries. Paste in Japanese text from a website, email, an eBook, or anywhere else, and we'll add furigana or romaji to every word. We also enable you to tap on any word to see its definition. This will truly change the way you read Japanese. And now, you can get the same experience right in Safari using our Safari extension. Personal experience (as well as a good deal of research in second-language acquisition) has shown us that the words that you're most likely to remember are the words that you're encountering naturally. To this end Nihongo automatically draws from your search history and clippings to compile flashcard decks filled with words for which you already have context. This makes it easy to study both the words you looked up during Japanese class, and those that appear in your favorite song or videogame. And by adding notes to the back of flashcards you can further connect each vocabulary word to your personal contextual understanding. 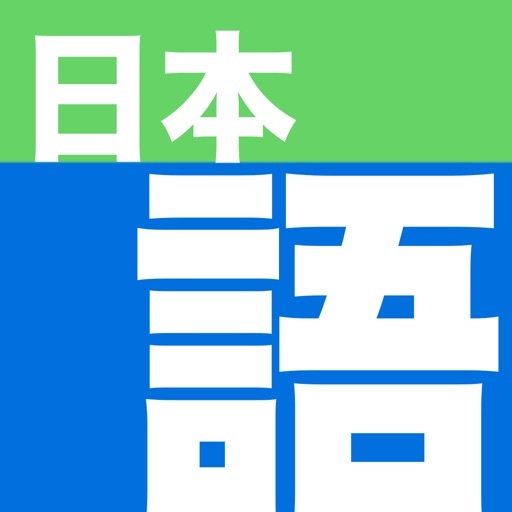 Kanji flashcards prompt you to draw the missing kanji from the words you're studying, creating stronger connections between the characters and their real-world use. 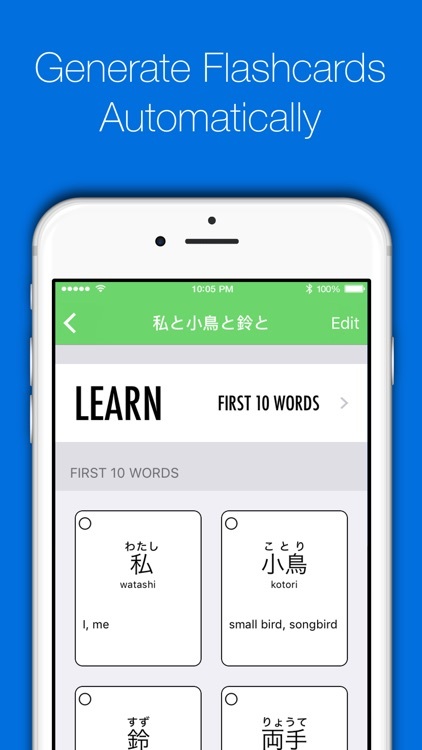 Built-in kanji decks give you 2 or 3 key words to study for each kanji. 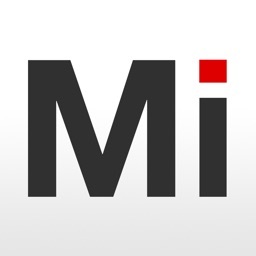 This app is only possible because of the JMDict (edrdg.org) and Tatoeba (tatoeba.org) projects. 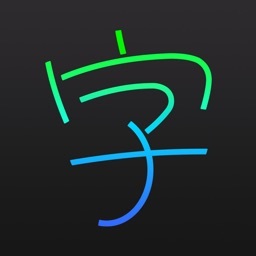 I highly encourage you to support these incredible projects that make apps like Nihongo possible! * Over 180,000 words, 165,000 example sentences, and 6000 kanji entries. * Every word clearly marked as common, uncommon, or rare. * Add your own notes to any dictionary entry. * Quickly identify transitive/intransitive word pairs. 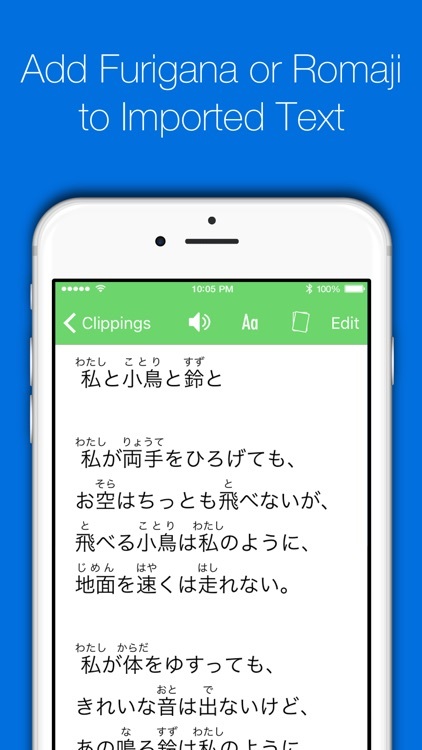 * Adds furigana or romaji to text pasted into the app. * Tap on any word to see its definition without leaving the clipping. * Flashcard deck automatically created so you can study the new words in a clipping. * Display text horizontally or vertically. * Have Nihongo read any clipping out loud. * Flashcards automatically generated from words you lookup in the dictionary or paste into the app. * Nihongo learns what words you know, and won't bother you again with words you've mastered. * Built-in kanji flashcard decks up through Middle School. 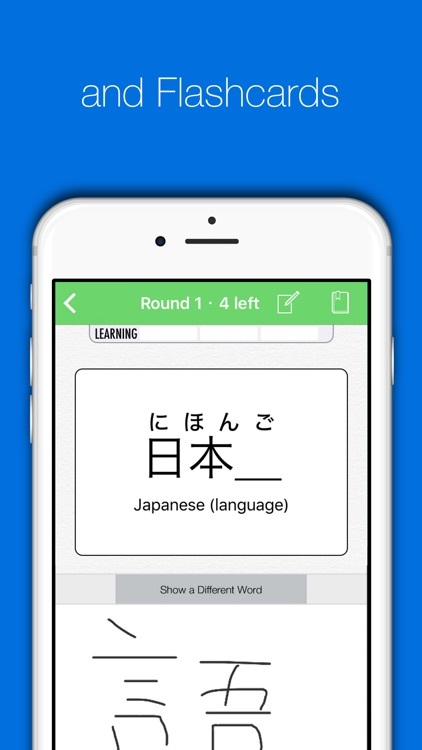 * Intuitive spaced repetition flashcard system for vocabulary and kanji drawing. * Level up flashcards by studying every day. * No penalty for missing a day of study, come back anytime. * Search using English, Japanese, or romaji. * Supports searching for conjugated words in both English and Japanese. 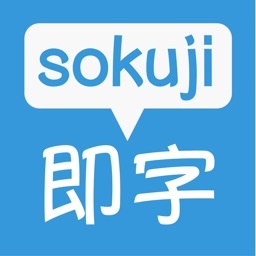 * Search for kanji using radicals and stroke counts. * Add furigana or romaji to webpages. * Tap on words to see definition within Safari. 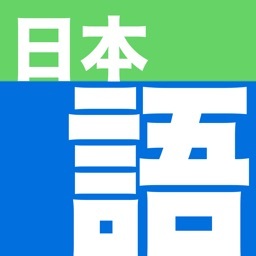 Nihongo is free to download and use. Should you choose to upgrade to Nihongo Pro, we offer 3-month, yearly, and lifetime subscription options. Subscriptions can be managed and auto-renewal turned off in Account Settings in iTunes after purchase. Once purchased, refunds will not be provided for any unused portion of the term, and any unused portion of a free trial will be forfeited. 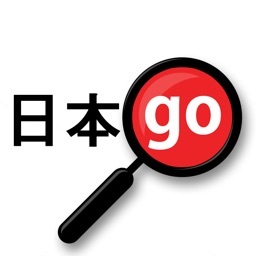 Read our full Terms of Service at https://nihongo-app.com/terms_of_use.html.